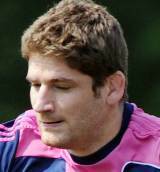 Pascal Pape is a powerful second-row who turns out for Stade Francais in the Top 14 Orange. He formerly turned out for Bourgoin and Castres before linking up with Stade in 2007. He has established himself as a key cog in their second-row and has recently transferred that form onto the international stage. He took his Test bow against Romania for France in 2000 and he marked the occasion with a try. But when Marc Lievremont took the French hot seat in 2007, Pape failed to hold down a frequent first-team spot, though he had his opportunities - notably in the 2009 tour of the southern hemisphere. Having made just one appearance during the 2011 Six Nations - from the bench against Wales - Pape was a surprise inclusion for the 2011 World Cup. But by the end of the tournament, he was one of France's first names on the team sheet and played a key role in Les Bleus' charge to the final. Lievremont's replacement Philippe Saint-Andre retained Pape in the French mix and made him captain for their 2012 tour to Argentina and later their autumn series. Previous skipper Thierry Dusautoir missed that tour and was widely expected to retain the captain's armband for the 2013 Six Nations but Saint-Andre opted to stick with Pape.